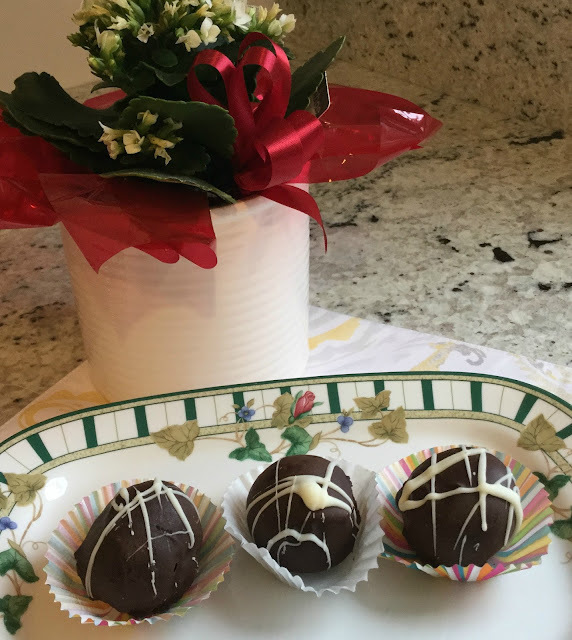 I was introduced to Oreo Truffles five years ago when I visited my sister in Ohio. I think they called them Oreo Balls then. 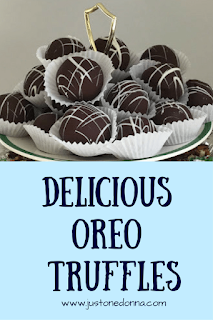 Whatever they are called, Oreo Truffles are tasty little bites that are perfect any time of year or for any occasion. They have become a staple for Just One Donna holidays, but they are also a tasty treat for a summertime barbecue. All the Oreo Truffle recipes are basically the same, so there is no specific attribution for the recipe I am showing you. 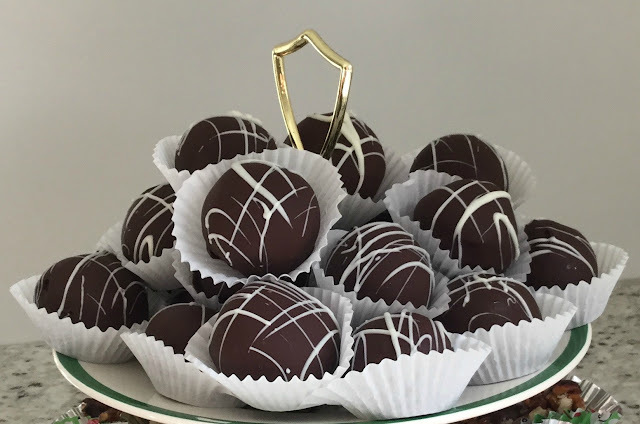 Whenever I make these truffles I use semisweet chocolate chips or bittersweet chocolate chips for the candy coating. Most of the recipes I have seen online use almond bark. I've tried almond bark but prefer chocolate chips. Choose whatever chocolate option you prefer. There are many different Oreo flavors available today you may want to experiment with. 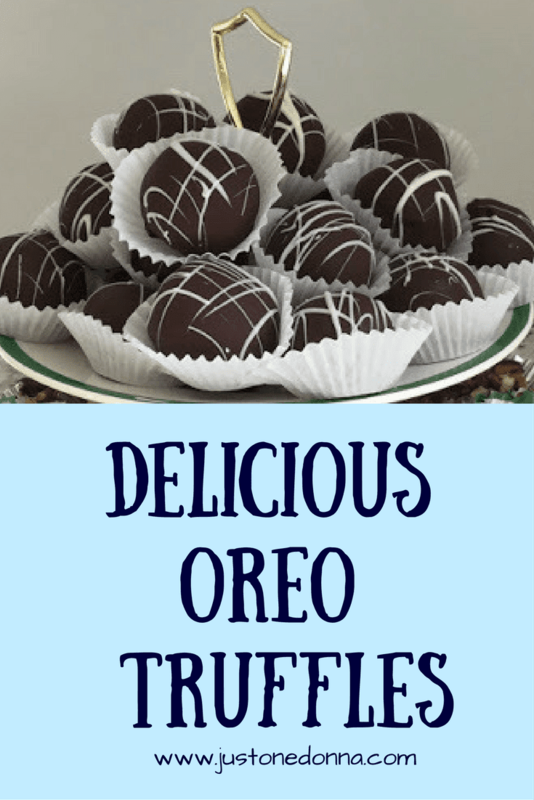 I have tried the mint Oreos and the peanut butter Oreos, but keep coming back to the traditional creme filled Oreos for this recipe. It couldn't be easier to make these truffles. Let's make a batch of Oreo Truffles, shall we? I made this quick video to show you just how easy they are to make. Break a package of Oreos into the bowl of a food processor. You really need to use a food processor for this because you want the cookies to be processed into small, consistently sized, crumbs. Pulse the cookies for ten to twelve pulses, or until they become crumbs. Next, add the cream cheese in chunks to the bowl of your processor. Process the cream cheese and cookies until the mixture is well combined. The mixture will clump to the side of your bowl. Roll one-inch balls and place on a wax paper or parchment-lined sheet pan. You'll make approximately forty one-inch balls. Chill the balls in the freezer for one hour. Melt the chocolate chips and shortening together in your microwave at 50% power for 3-5 minutes. The shortening will help to make the chocolate coating glossy. Using two forks, roll the balls in the chocolate and set them back on the lined sheet pan. Return the balls to the freezer to set for 15-30 minutes. I know these look a teensy bit messy, but they are easily trimmed with a knife. Melt the white chocolate chips in your microwave at 50% power until thin enough to drizzle over the Oreo Truffles. Once set, package the truffles for longer term keeping. They keep well in the freezer. Before serving set the Oreo Truffles on the counter for 15-20 minutes to thaw a bit.